Even though my exhibit at the Gallery Cafe has ended, I thought I would post one more painting from the show. It was my only portrait. I call it Waiting for Mom. 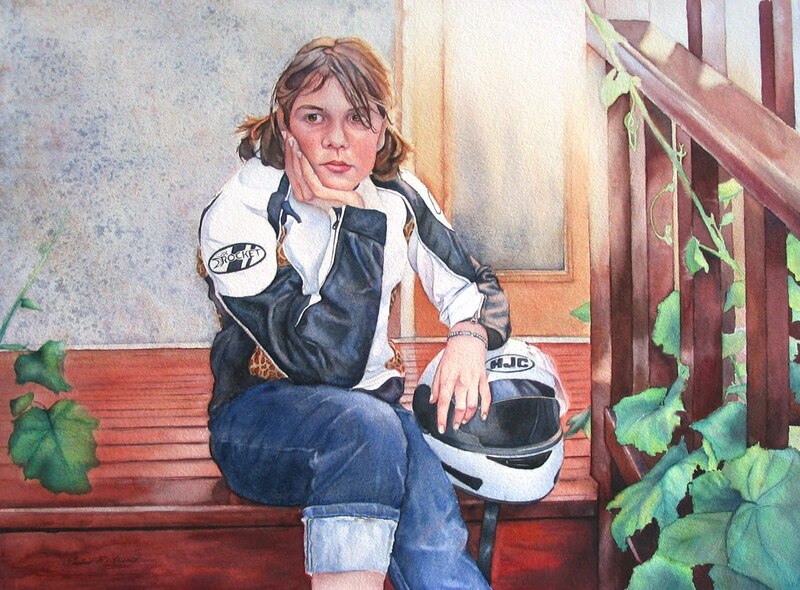 This painting is of one of my daughter's friends that was waiting to be picked up by her mother and go for a ride on her new motorcycle. Loved the jacket and the bored look. 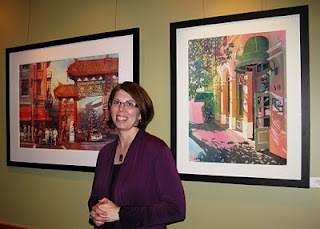 Today is the last day of my "Views of Victoria" exhibit. Be sure to stop by and see it before it is gone! Flavour of Spain – interview with Terry Mulligan coming up on radio and http://www.tastingroomradio.com/ where you can listen online 11-12 noon PST on Saturday,27th – looks like it is the penultimate segment so probably around or after 11:30 - or download it later on itunes for free. This is the last weekend to see my show at Cedar Hill Rec. If you haven't made it there yet, be sure to drop by. If you have been, you probably saw the above painting. It is titled Foxgloves and is on Johnson St. across from Market Square. I did this painting in my pouring class last summer at the Monterey Centre. I will be doing another pouring class this summer as well. Be sure to look for it in the summer catalog that comes out in May. Victoria has a wonderful Chinatown. It is one of my favorite parts of the city. Plus it has a great restaurant there (The Noodle Box) and is only a street away from the best art store (Opus). 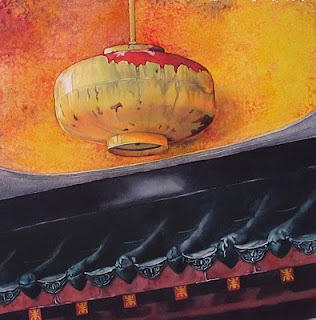 What was fun about this painting was the texture on the wall behind the lantern. I used Kosher salt to create it and some beautiful colors- New Gamboge and Winsor Red. 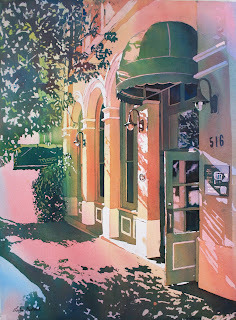 There is one painting in my Views of Victoria exhibit that is not of Victoria and surrounding areas. It is the one of the stairs at El Molino in Spain. I put this in because I am taking a group of students from here to Spain in June. 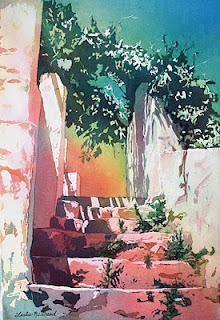 It is a 12 day painting excursion in Andalucia (Southern Spain). 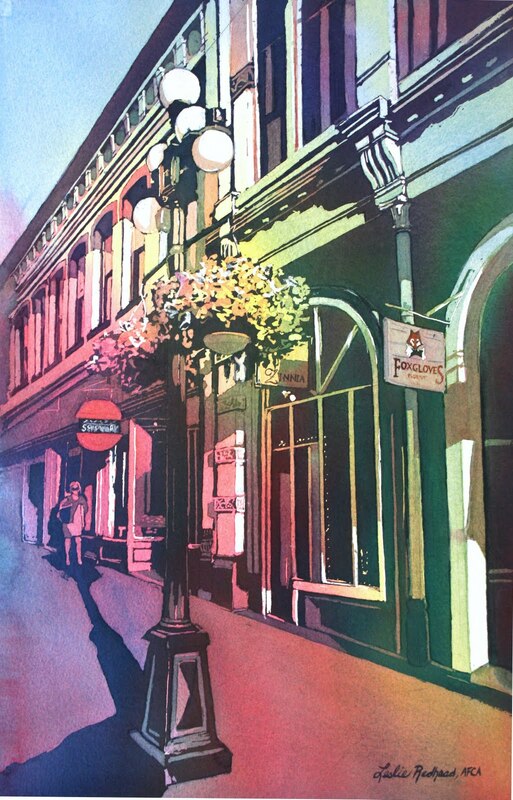 It will be a wonderful tour of the area and painting instruction with myself and Rick McDiarmid. There are a few spots left so if you are interested, more information may be found at http://www.flavourofspain.net/. McNeill Bay is just down the street from where I live in Oak Bay. It is well known to me since I take the dog for walks/runs about everyday there. It is beautiful no matter what time of day and it makes me appreciate where I live. On a side note, my painting Storm Over Tofino was featured on the blog http://www.theheartoftofino.com/. Thanks to Adrienne for putting it on your great blog about a great place. If anyone plans to visit the island, be sure to include Tofino in those plans. The best part about where I live is that it is a walking city. I walk everywhere. There seems to be a sidewalk that runs along the beach and goes around the whole island- or at least my part of it. This scene is from one of my walks. It is along Beach Dr (appropriately named) near the Victoria Golf Course. It was morning and the sun filtered through the leaves just right. Of course I had to paint it. We are at the end of our Cherry Blossoms here. Spring came early and the Blossom count for the year hit a record high. I painted this for one of my classes just as they were starting to pop. It is another small painting and is part of my show at the Gallery Cafe. This is another one of my small paintings. It is of Tofino on the west coast of the island. Tofino has this beautiful long sandy beach. Not only is it known for the beautiful beach and surfing but alot of storm watchers go out there during the winter. I love painting storms and rain in watercolour. These beautiful oak trees (named Garry oaks) grow all over Oak Bay (hence the name). They are so much fun to paint. This painting I did for my water class. I was trying to demonstrate how to do ice. I have received the most comments from the show about this painting. And it was the first one to sell. Last night was my artist reception. It started off as a big fiasco. The Gallery and Cafe were closed because a water main broke and was being fixed. So the Centre decided to cancel the reception without telling me! I found out through someone else at 3:30 yesterday afternoon. Called the Centre and the supervisor told me that the real issue is the food since the Cafe had to be closed. We decided to go ahead with the reception since it was now 4 and I had sent out a bazillion emails inviting clients, students, and friends. I just needed to provide the food. So I frantically ran out to the store to pick up all the food and supplies, picked up my daughter from swimming, ran home to quickly prepare some of the food (most I did buy prepared), fix dinner for the kids (frozen pizza) and get ready. Made it to the centre by 6:30 and ready by 7, thanks to a few friends and my daughter. 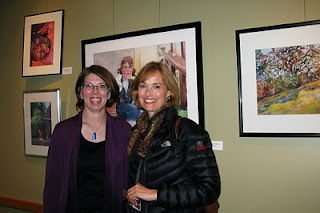 In the end, I had several friends and clients show up and I sold several paintings! Well worth the last minute running around. 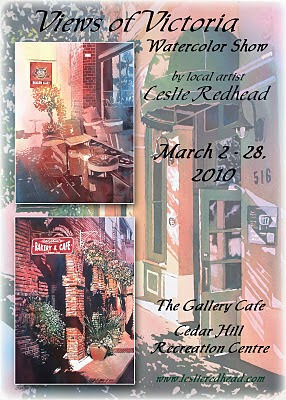 Throughout the month of March I will be showing some of the paintings that are on exhibit at the Gallery Cafe. This painting is of the Parliament building in Victoria and the Harbour Ferries. It is another pour. I will explain how I do a pour to those of you that are not familiar with the process. I begin with deciding which areas I want to leave white. I will then use a resist or masking fluid to save that white area. I now wet the paper and I pour liquid watercolor across the paper. This will establish my next light value. After it dries, I do another layer of masking fluid to save the colors that I want. Then I wet the paper again and pour more liquid watercolor. I continue to build up layers of masking fluid and poured paint. Each time I make the liquid paint more concentrated and I use an eye dropper to control some of the color. I do this about 4-5 times until I get the desired result. Finally, I pull off the masking fluid and viola! I have a painting. It is magic. My show, Views of Victoria, opened today at The Gallery Cafe. I have about 35 pieces that are hanging in the Gallery. My larger pieces are mostly pours of the city. The smaller pieces are my quick landscapes. My sister did this wonderful image to advertise for the show. Thank you Kris! 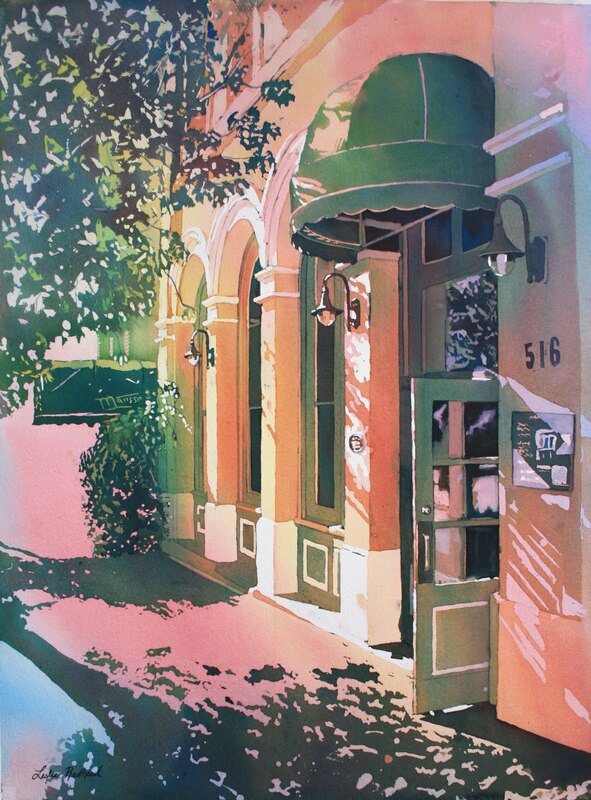 The artist reception is this Friday, March 5 from 7-9pm. Hope to see several of you there.